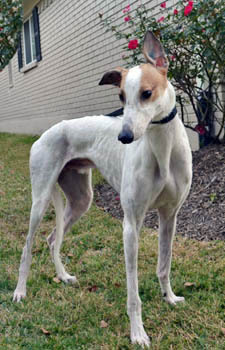 Westley, aka Ugo Faust, is a 6-year-old white and red male born March 29, 2010. His sire is Soprano Drive and his dam is Ugo Katy Fit. 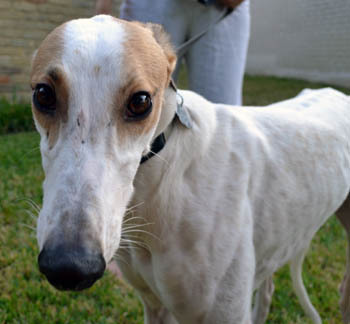 Westley started his racing career at Gulf Greyhound Park on September 15, 2011. It ended there on August 11, 2012 with a broken hock. 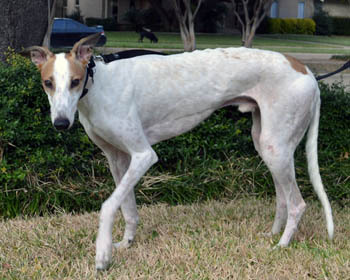 He had surgery at the Dallas Veterinary Surgical Center on Wednesday, August 18th to repair his central tarsal bone fracture. Dr. Bob Barstad placed two screws to stabilize the bone. Dr. Barstad is happy with Westley's recovery, but cautions that the screws may need to be removed in the future if they cause irritation. 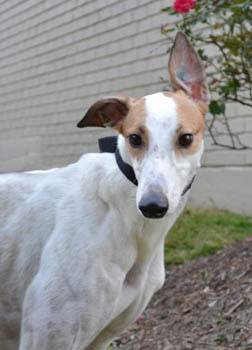 Westley was in a home for three years, but has returned to GALT due to a change in family circumstances. He is not cat tolerant, but does very well with children and small dogs.